Matthew Apgar - mapgar@shawmedia.com Hunter Pearson of Crystal Lake, 13, prepares to tee off during a one-on-one lesson with Golf Academy at Terra Cotta owner Jim Buenzli on Tuesday, Feb. 16, 2016 in Crystal Lake. 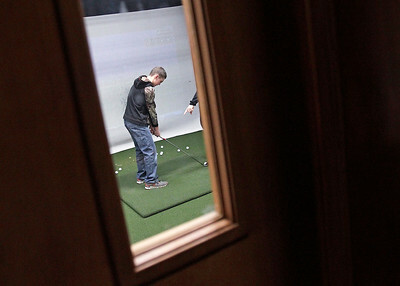 Matthew Apgar - mapgar@shawmedia.com Hunter Pearson of Crystal Lake, 13, gets a one-on-one lesson with Golf Academy at Terra Cotta owner Jim Buenzli, right, on Tuesday, Feb. 16, 2016 in Crystal Lake. The indoor golf range uses multiple cameras and a projection screen to analyze speed, distance, accuracy, and more. 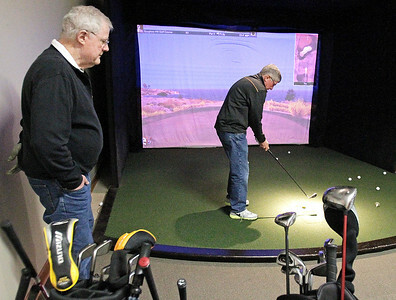 Matthew Apgar - mapgar@shawmedia.com Mike Ruhl, left, watches as Rick Oliveira, both of Crystal Lake, as they play on a simulated golf course on Tuesday, Feb. 16, 2016 at Golf Academy at Terra Cotta in Crystal Lake. Despite cold, snowy weather, the simulated golf courses offer an opportunity to play in a different climate without having to travel there. Hunter Pearson of Crystal Lake, 13, prepares to tee off during a one-on-one lesson with Golf Academy at Terra Cotta owner Jim Buenzli on Tuesday, Feb. 16, 2016 in Crystal Lake.